Yesterday afternoon we had considered camping here at French Creek for two days. But this morning we decided to head back toward the Town of Riggins. 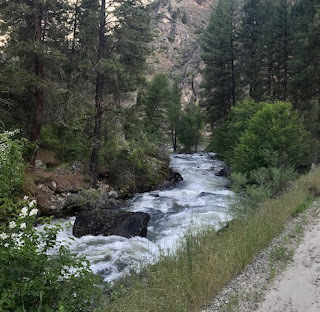 The reason for this is because Tránsito is unable to safely go further upstream along the road which parallels the Salmon River. Tránsito's front wheel drive slips so easily on these gravel roads. We are ready to head out of our Camp at French Creek. But first, we want to take a walk down the road to take a look at the Salmon River. The confluence of French Creek and the Salmon River is only a few hundred yards away. The Salmon River is way down there! During our walk, we found a trailer that was camped in an opening to the Salmon River. 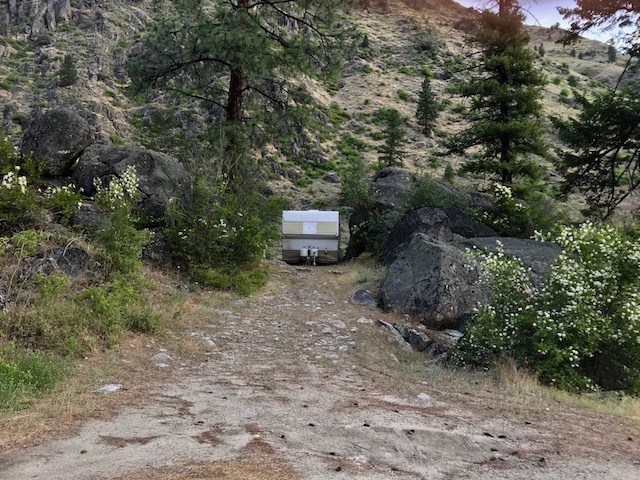 This is a similar camp to our own that we made in May 2004 when MsTioga camped between two boulders with the Salmon River below. We are traveling on US 95. When we went over the summit before the Town of Grangeville, we saw that the T-Mobile signal had returned! We pulled over and uploaded two day's saved Blogs with pics. When we are not connected to the net, we continue to Blog using Apple Notes. We take pics and paste those pics into Notes. Then, when our T-Mobile connection returns, we upload the Notes into Blogger! Again, we are not able to obtain a workable data connection with our T-Mobile provider. This likely has something to do with congestion here in the Town of Grangeville Idaho. So, we are back to Blogging with Apple Notes again. PS: Our T-Mobile data connection is spotty. Sometimes it's there. Sometimes it isn't there! A few minutes ago, it returned. We have made an Afternoon Camp here in Grangeville. Since we arrived in town, we have used a Do-It-Yourself Carwash in order to quickly remove all of the dirt and road dust from our excursion into the Salmon River forest area. Otherwise, it would have taken us several days to wash all of that dirt and dust away. Remember George, "It's not about the destination; it's about the journey." Really enjoying following along with you on the journey. I look forward to seeing your pictures and reading your posts every day. Your comment is a wonderful compliment for me! Wow that camp by the boulders sure looks like the same camp you made years ago. Beautiful country & rivers. I just checked a Google Map. You are right! Same place! Just a short walk from yesterday's Camp! Try using trekking poles to keep your balance while walking...it helps a lot. I use it when I go walking or hiking. Thank you for your "trekking poles" suggestion. Your thinking is correct, in my opinion. If I am still in good physical shape at the end of summer when I return to San Diego, I may trade both Tránsito and Scampy for a 4WD pickup with a camper. OR..... a very small RV. When I drove MsTioga [A 27' Class-C RV], I never had slipping problems. On my rear wheel drive truck, I have to put weight in truck bed to navigate through mud to get traction...so I fill a 55 gallon barrel of water to accomplish that. When driving in sandy soil, I deflate the rear tires a little to get traction also. Lynn is correct. The weight should be towards the front for the front wheel drive to have traction, I believe. 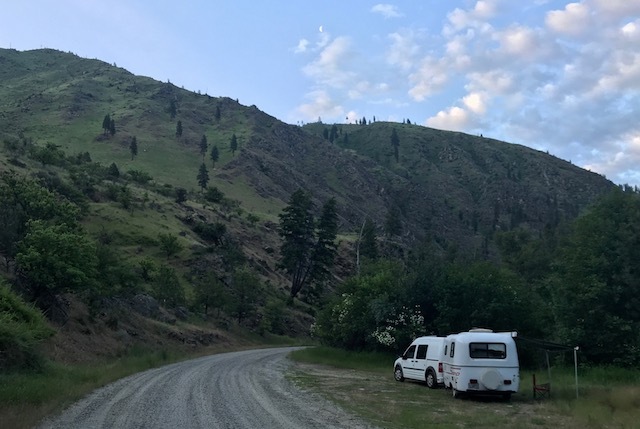 I see very nice Class B RVs on side bar when I read RV blogs. Smaller than Tioga that you once drove. I'm not sure if these Class B have rear or front wheel drives. I wouldn't get another front wheel drive if you plan to carry weight. George.. after camping in places like this I dont know how you can ever go back to the city! I just gotta be strong when San Diego beckons me about next September!